The following is a liturgy I wrote for use during Advent. Permission for use in worship is granted. A note that it was “written by Robb McCoy, at http://www.fatpastor.me&#8221; would be appreciated. If you’re going to use it, I also love hearing about it in the comments below, but that’s not necesarrt. The musical settings found in the liturgy are Copyright 1990 Steve Garnaas-Holmes. Published by The General Board of Discipleship of The United Methodist Church. The links are to a pdf file. Some of the Words of Institution are also from the United Methodist Book of Worship. One: In this season of expectant waiting, we are invited to Christ’s table here and now. Coming to Christ’s table is a way to experience the grace of God. Therefore it is open to all. The only requirement is a sincere heart. The only barriers to the table are created in our own heart. So we come together as a people to confess our sins to God. We confess as a people because we all fall short of God’s plan of perfect love. We do not confess to avoid punishment. We confess to free our own hearts and minds, so we may remove the barriers we build between ourselves, our God, and our brothers and sisters. One: Out of the wilderness a voice calls out. Prepare ye the way of the Lord. Prepare ye the way of love. Prepare ye the way of forgiveness. The Christ child was born in the midst of darkness. The waiting is over. Christ may be born today in your heart. In the name of Jesus Christ, we are all forgiven. All: Joy to the World. Amen. One: Now let us give thanks to the Lord our God. All: How good it is to give thanks and praise. One: It is good to give our thanks and praise. It is a good and joyful thing always and everywhere to give thanks to you, God Almighty, creator of heaven and earth. You create the world from chaos. By simply speaking, you set the cosmos into motion, and create all things from the dust of stars. All: Blessed are you, O God the Father, Creator of heaven and earth. One: God of many blessings, you called out a family to be a blessing to all the families of the earth. You gave them a land, and promised to make of them a great nation so that all of the nations of the world could be blessed. All: Blessed are you, God of Abraham and Sarah. One: God of salvation, when the people were but slaves in Egypt you called upon your servant Moses. You gave him the power to speak salvation to the Pharoah, and led your people out of slavery. You led them over the water, and helped them Passover into freedom. When the people were hungry, you gave them food from the sky. When the people were thirsty, you brought forth water from the rocks. When the people were no people, you gave them the Law. All: Blessed are you, God of our salvation. One: When the people asked for a King, you anointed David to be a just ruler. Though flawed, David united the people, and you promised to be with his line forever. When the Kings rebelled, as you warned them they would, you anointed the prophets, who called the people back to obedience. The prophets spoke the truth to power, and called the people to remember who and whose they were. The prophets warned the people of the consequences of injustice and false worship. When the people fell into exile, the prophets spoke words of hope and restoration when all around them, there was nothing but despair. All: A voice is crying out: “Clear the Lord’s way in the desert! Make a level highway in the wilderness for our God! One: John the Baptist came, telling the people to “Change your hearts and lives! Here comes the kingdom of heaven!” John wore clothes made of camel’s hair, with a leather belt around his waist. He ate locusts and wild honey. People from Jerusalem, throughout Judea, and all around the Jordan River came to him. As they confessed their sins, he baptized them in the Jordan River. And so now we come, having confessed our sins, searching for the Holy Spirit to come and fill us with expectant grace. We come to be transformed by what has already come, and waiting with hope for what is to come. We deck our halls with joy, but it is our hearts that truly matter. All: Prepare the way of the Lord in our world. Prepare the way of the Lord in our communities. Prepare the way of the Lord in our churches. Prepare the way of the Lord in our hearts. One: And so, in hopeful anticipation, we give thanks to you, God of Creation, God of Abraham and Sarah, God of salvation, God of the Law, God of King David, God of the Prophets, God of hope and deliverance, God of John, and God of us all. We join in praise and come together to sing unending hymn of the saints of glory. Holy, Holy, Holy Lord. God of power and might adored, heaven and earth are shining bright with the glory of your light. Loud Hosannas now we sing. In the highest they may ring. Blessed is the coming one. Christ Emmanuel your son. Glory in the highest. Holy God, your name is blessed. One: Holy are you, and holy is your Son Jesus Christ, who is the Word made flesh. All: Holy are you, and Holy is your Son Jesus Christ. One: Who is the one to whom John pointed in the wilderness. One: Who was born to us in a manger, for there was no room in the inn. One: Who came to show us the way to your love. He proclaimed good news to the poor. He restored the sight to the blind. He called the children to his side, taught the women, ate with sinners, and called out the religious leaders blinded by the letter of the Law. One: Who was betrayed by those who loved him. Who was persecuted by those who feared him. Who was crucified by those who thought that his death would be the end of him. One: And so, in remembrance of these your mighty acts in Jesus Christ, we offer ourselves in praise and thanksgiving as a holy and living sacrifice, in union with Christ’s offering for us, as we proclaim the mystery of faith. 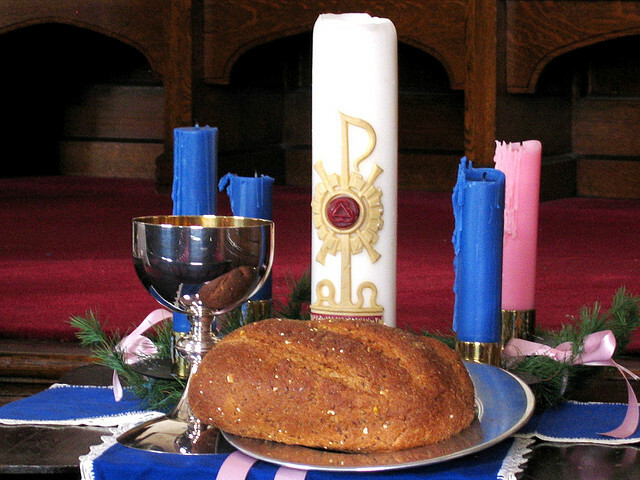 One: Pour out your Holy Spirit on us gathered here, and on these gifts of bread and wine. Make them be for us the body and blood of Christ, that we may be for the world the body of Christ, redeemed by his blood. Make us a Christmas people, secure in what has come, and hopeful for what is yet to be. By your Spirit make us one with Christ, one with each other, and one in ministry to all the world. Keep us vigilant in our Advent waiting until Christ comes in final victory and we feast at his heavenly banquet. Through your Son Jesus Christ, with the Holy Spirit in your holy Church, all honor and glory is yours, almighty Father, now and forever. Amen. For a full blog post, go here. Few of us ever plan on going to prison. No one wants to spend time in a jail cell. Yet many of us spend time in one every day. We spend time in jails built around us. Sometimes they are barely noticeable. Like the fish that doesn’t know it is in a fish bowl, or the bird that doesn’t know the world outside the cage, we spend our time in prison. These are the prisons of injustice. They are the prisons of systems that keep us from fulfilling our dreams. They are the walls that are built by those that want to keep others oppressed. Hope and possibility are kept out, and all that remains is a cycle of despair. Sometimes we are in prisons that we built ourselves. We guard our pain and our torment and make sure nothing is able to penetrate the walls we build. We have been hurt too many times, so we build walls. We remain in the cell because the outside world is full of pain, and at least inside the cell we have the illusion of safety. Intimacy and friendship are kept out, and all that remains is superficiality. Sometimes we are in prisons that have been built for us. These walls are built by sickness, or by those that hurt us. Sometimes great wrongs are inflicted upon us. Sometimes the tragedy is too much to take. Some say, “God doesn’t give us what we can’t handle.” I don’t believe it, because I don’t believe it is always God that is giving it. Sometimes the pain is just too much, and the walls of the prison are too strong to break free. Healing and joy are kept out, and all that remains is pain. In Matthew 11:2-11, we find John the Baptist in prison. He was imprisoned by a King that did not want to hear the truth. John spoke the truth to power. He called for repentance. He called for a change of heart. He called upon people to follow the path of righteousness, and he prepared the way for the one that would come. But he was not imprisoned until he demanded too much of the King. When he impeded the powerful from having his way, he had to be stopped. He was kept alive, for awhile, by the will of the people. John was called the “greatest of all those born of a woman,” by Jesus. And yet as he was in jail, he wondered. It can be dangerous to inject too much of our own thoughts into figures in the Bible, but here it is almost impossible not to wonder what John was thinking when he sent a messenger to Jesus. “Are you the one? Or are we to wait for another?” he asked. Is the question a sin unto itself? Maybe. But at least I know that I’m in good company. I’ve never felt that doubt is the opposite of faith. . So, trapped in our prisons, what do we do? What is Jesus’ answer? Of course, Jesus doesn’t give us a straight answer (That is why I think doubt is not an obstacle to faith, but lines the pathway of faith. If Jesus wanted us to never doubt or question, he would have given us more straight answers.). This Advent, we still wait. We wait like John in prison. Not held in by despair, but looking always outward. Looking from within our own prisons at the world all around. Waiting and watching with God’s eyes to see the signs. Waiting is never a fun activity. We do everything in our power to avoid waiting… for anything. We fill our time with noise. We go to restaurants designed to limit waiting as much as possible. We go to grocery stores where the lines are filled with things to read, and last-minute items to buy. What are waiting rooms filled with? TVs, magazines, some even check out ipads. Advent is a season to wait. Wait and watch for Christ in our midst. In a world addicted to instant gratification, the act of purposeful waiting is a revolutionary act. It is a soul-cleansing act. We wait with eyes wide open. We wait with hearts open for Christ, seeking the answers to our questions in the stories of hope and grace. We wait, seeking forgiveness. We do not rush into anything, because you cannot rush something as powerful and painful and precious as forgiveness. 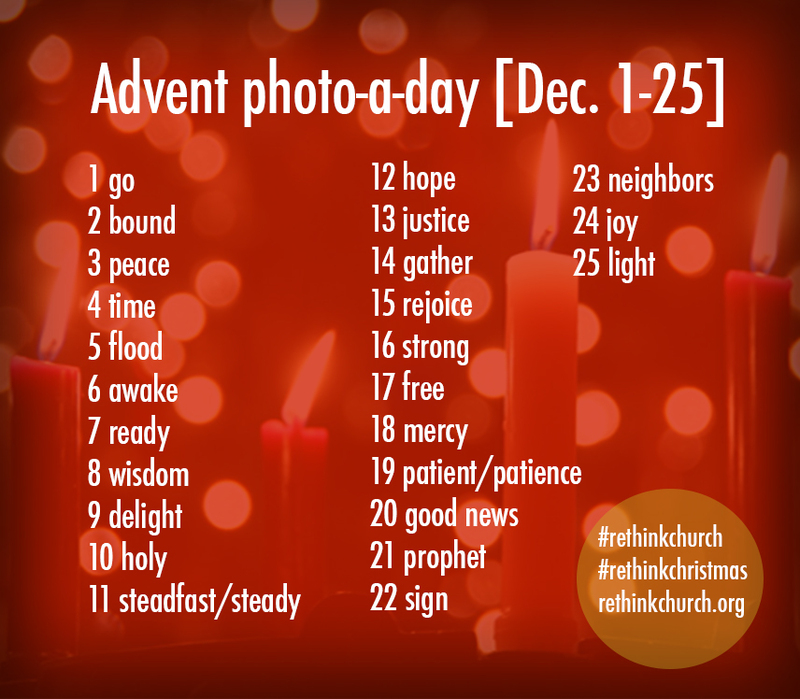 This Advent, we wait like John in prison, who was called to notice the signs all around. 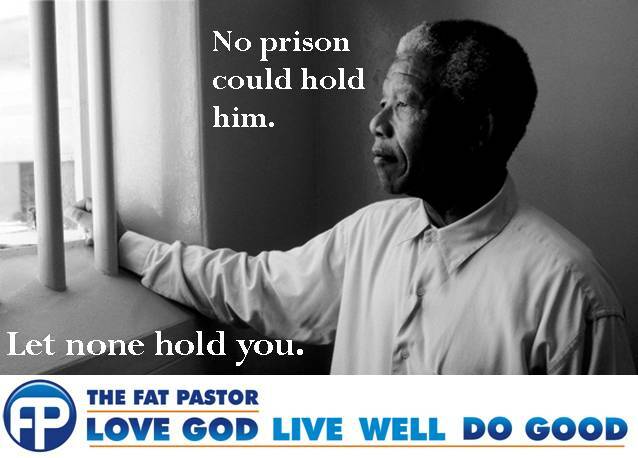 We are called to look beyond the walls of our prison. Don’t ignore the walls, but do not let them defeat you. Look beyond the walls, and do not let them contain you. See the signs of mercy, justice, and love. 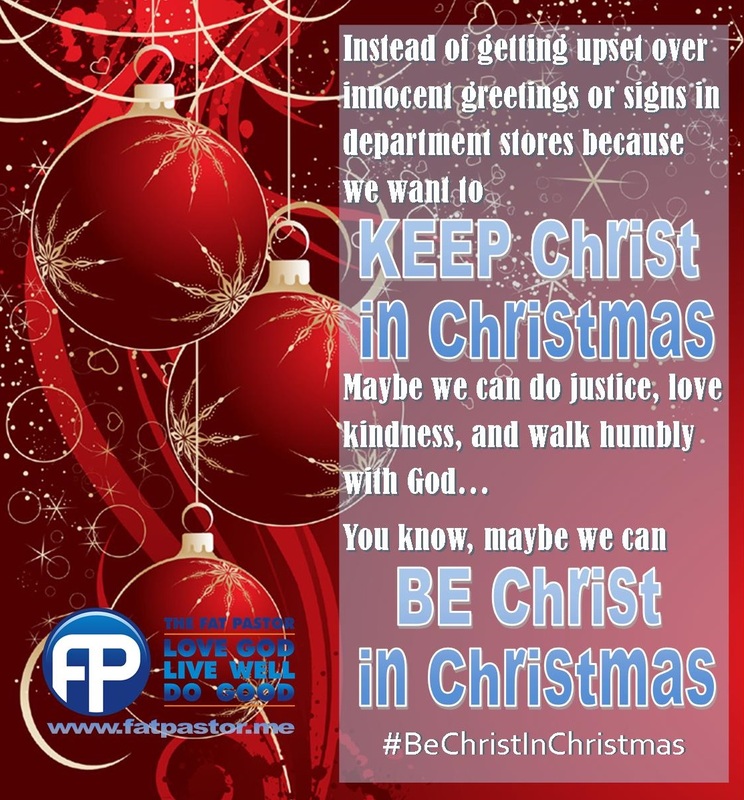 See Christ all around – not in holiday decorations or TV specials. See Christ in the hearts of others. The prisons made by sin and injustice can feel impenetrable, but there is freedom in Christ. No prison held Mandela. No prison held John. Let none hold you. Rethink Church has come up with another great chance to combine social media, art, reflection, and devotion. The concept here is simple, prepare the way for the coming of the Lord by spending each day reflecting on a concept or theme. Then take a picture of something that you feel represents that theme. Share the picture on twitter, instagram, pinterest, facebook, and maybe someone you know will take some time to reflect as well. This is not only a great tool for reflection and devotion, but a tool for evangelism, and connecting to others. Once again I commend my friends at RethinkChurch.org for providing this tool that has so many positive facets. More "Your Momma's so nice..."